On Sunday we had twenty six including two goalies. Good to see S Mehigan and P Smith back with us, and the pretty face of M McBride. With so many talented hockey players turning out I had to work hard, and dig into my years of experience to pick two evenly balanced teams. Pulling on a white jersey, I came under all sorts of verbal abuse. Even when I went into the other changing room I was given pelters. It was a long time since I had been dressed up for Halloween ? One muppet told me the white helped bring out my complexion. I was only letting everyone know I was not racist. 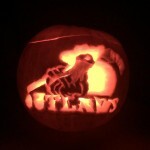 Never new we had an artist in the club.Jaqui carved the Outlaws logo on a pumpkin,and It was great. In spite of our swollen numbers we had a very fast game. The other thing I noticed was the quick line changes, because everyone wanted ice time. The game was end to end, from start to finish. Young Ryan had been playing the night before, and I think when he turned out to play with us, he still had the night befores game in his head. Other than one or two hooking and slashing incidents. It was probably one of his better games in an Outlaws jersey. Pity his old man never played as well ??? He only managed to score one goal. By the end of the first period the colours were in front by about three goals. At the start of the second half one of our Elite players. ( H Dog.) Clearly forgot what colour of jersey he was wearing and scored an own goal. Maybe the big cop on the ice should have given him directions as to what way he should go. He soon made up for his mistake by skating down the ice towing Cally who had his stick hooked under H Dogs arm. H Dog broke away, and scored. I think it was young Danny Davidson who let go a shot, it bounced in front of Jaqui, through her legs into the net. Hope she was not in training with the Clan goalie as the same thing happened to him on Sat, night. ! The whites made a good come back in the second half. Especially with Cally leaving fifteen minutes before the end of the game. However the colours necked it by two goals. Once again I had four enquires about joining us on Sunday mornings, and had to refuse. At the moment we have enough on the books. We had 26, two lads admitted free. 24 = £ 240, – ice £ 120, = £ 120 in funds.